Microsoft has extended the support for its Windows Vista operating system till April 2017. 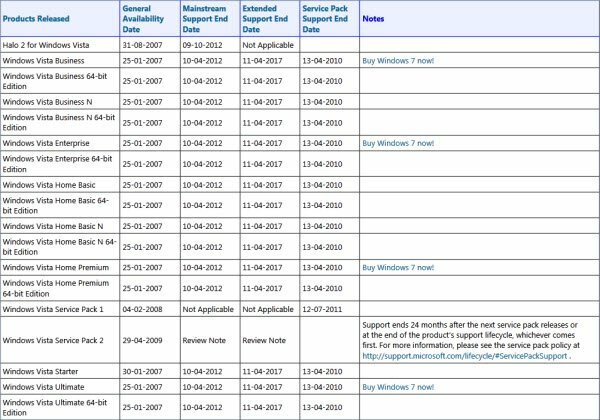 Earlier mainstream support for this iteration of Windows, was scheduled to expire on 2012, but Microsoft has now decided to offer Extended Support till April 2017. Windows Vista mainstream support was to end according to Microsoft on 4/10/2012 , with extended support for Vista Business and Enterprise ending 4/11/2017. There was no information available on extended support for Home, Ultimate, SP1 or SP2. Windows Mainstream Support implies that the operating system would continue to get even feature updates apart from security updates, whereas Extended Support for Windows implies that Microsoft will no longer add any new features to Windows Vista and offer only security updates and patches. With this change, Microsoft has now confirmed that it will offer 10-year support to Windows. You can see the details at the Microsoft Lifecycle website. Microsoft has announced that it will offer extended support for Windows 7 till January 14, 2020. A better support idea would be to offer a free upgrade to Windows 7 :).